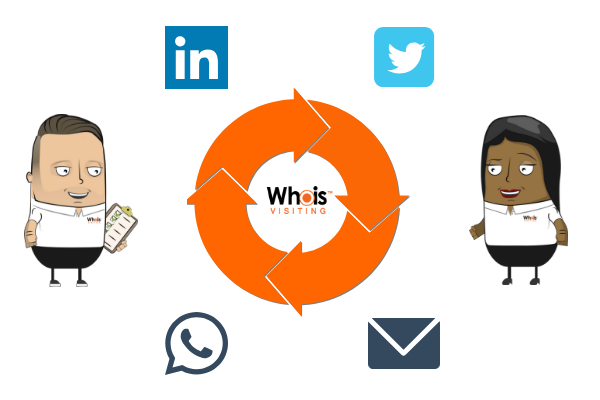 Whoisvisiting provides you with a solution to Identify the anonymous companies who have been browsing your website information, products and services. Your business can use this data to highlight legitimate interest and action sales opportunities. This post will show you how to make a sale for free, before your 14-day, no obligation trial has concluded. What have you got to lose? There are many variables, but your website visitor data volume will ultimately be proportional to the quality and frequency of your marketing output. 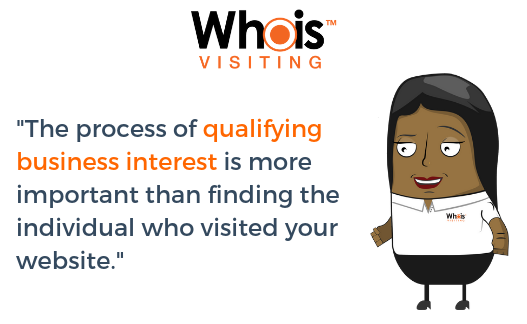 Whoisvisiting acts as a catalyst to help your business maximise the value of your marketing efforts and spend. Read here about a range of digital marketing activities to drive more traffic to your web pages, short and long-term. But for the purpose of your Two-Week Trial, you are either working with the amount of traffic which you receive currently, or you will want a fast solution to give you a sample of businesses to follow-up with, retarget and pitch to. If you are aware that you have a significant level of website traffic already, (check your Google Analytics dashboard, or general website hit counter), then proceed straight to the selling process with the button below. A fast, cost-effective and creative way to drive some relevant traffic to your website is through Twitter Ads. This can feasibly be set up and running within an hour and it doesn’t matter if you do not have an established or active Twitter business account. If you do need to set up a Twitter business profile, start here. 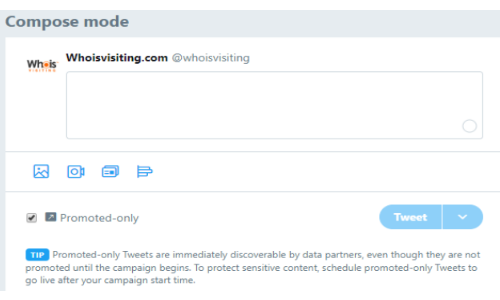 Once you have logged into your Twitter account, access your Twitter Ads hub from the menu dropdown. 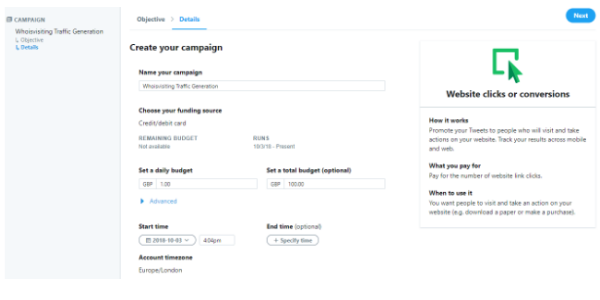 Then select to launch a Twitter Ads Campaign. At this point, you will need to select the campaign objective. For this case, it will be ‘Website clicks or conversions'. This is the top of the project, where you will branch different Ad Groups and creative posts from. You can create as many campaigns as you want. You may even choose to create campaigns based on specific variables such as keywords, locations or lookalike followers. Or specifically name it for the purpose of this experiment - Whoisvisiting Traffic Generation. Set a total budget and divide it by the 14 days (of your trial) to give you a daily spend. This can be altered going forward. The beauty of this advertising platform is that you are only paying for the website clicks which happen. There is no charge until something is actionable. And all impressions beyond this are free, including traffic from your Twitter bio. This can impact on your followers, brand awareness, branded search terms and direct traffic. 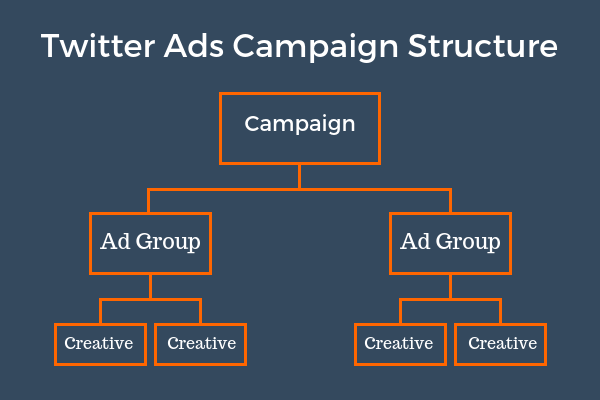 Your Ad Groups are the different categories of target who you want to see your messages from within the overall campaign. Again, you have the freedom to create as many Ad Groups as you like, depending on how broad or specific you want to be. 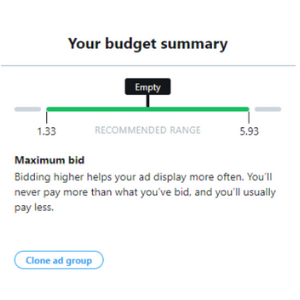 Prioritise and shift the ratio of your overall budget by placing a chosen amount for your individual Ad Group. Further to this, there is an option to set the maximum bid per link click. You will then be in full control of the cost-per-click. These may need amending based on the competitiveness of the target you have selected and the level of visibility you want. It is essentially trial and error until you find the ideal balance. It will then bring you to the creative section for this Ad Group. 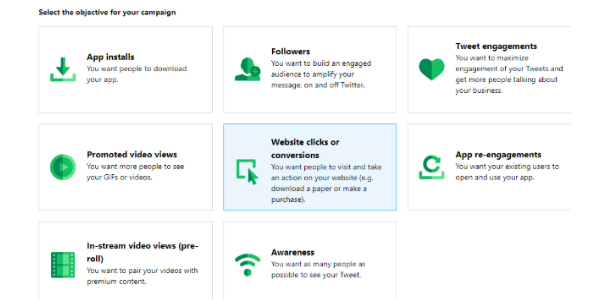 It will give the choice to select a previous Tweet for promotion or build a new one purposely for this campaign (reccomended). 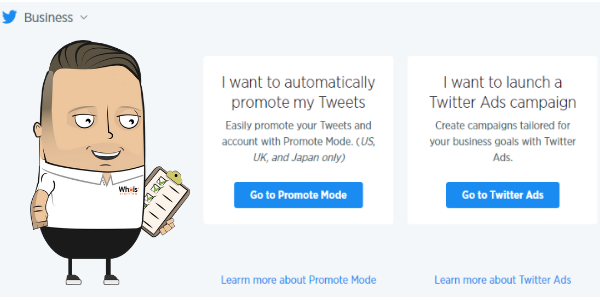 Compose and create with ‘promoted-only’ tweets so that you can experiment and the posts will not fill your timeline. Attach as many styles of creative to your Ad Group as you wish. Testing different messages with various images. You must also include your website or chosen landing page link. Marketers may be keen to build these links with URL parameters to track the success of different Ads if you are looking to implement a successful Twitter campaign longer-term. Discuss internally and find out which of these groups will remain constant and which variables you want to test alongside it. For example, you may only want to target the United Kingdom, but different Keywords from this location. Alternatively, you might only want to target a specific keyword, but test its success from the United Kingdom, Ireland and the United States. Simply clone the Ad Group, rename it and change what is needed. Ie: Competitor lookalike (United Kingdom). Now you are set to review and launch your campaign. Monitor the progress, traction and spend in the Ads Manager where it allows you to view the analysis including impressions generated by time, link clicks, results rate % and the pacing of the campaign for the day. With this new traffic incoming to your website, alongside the alternative organic, direct, social and paid marketing which may already be in place, it is time to action your data into potential sales value using our tool. 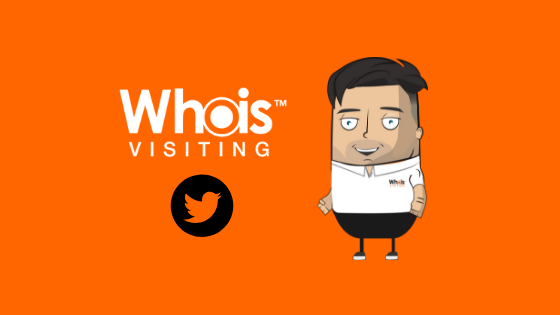 With a workable level of traffic being driven to your website and various landing pages, it is time to set about how to action this into sales using Whoisvisiting. Add all sales members to the platform as users. ‘real-time and daily’ trigger report connected to the page(s) which comes under their sales remit or job responsibility. For each day of your trial, order your visitor table by ‘page views’ and ‘time spent’ to identify the most-engaged website visitors and export this as a CSV for ongoing use. Ensure the top companies have been actioned into your sales pipeline and categoriesed for monitoring purposes. Your sales members now have a stream of leads to follow up with through the feeding of visitors via real-time and daily reports. With the upkeep of an organised visitor table, you will be in the best position to take advantage of businesses showing interest as efficiently as possible. You have two weeks to take advantage of this powerful data for Free. 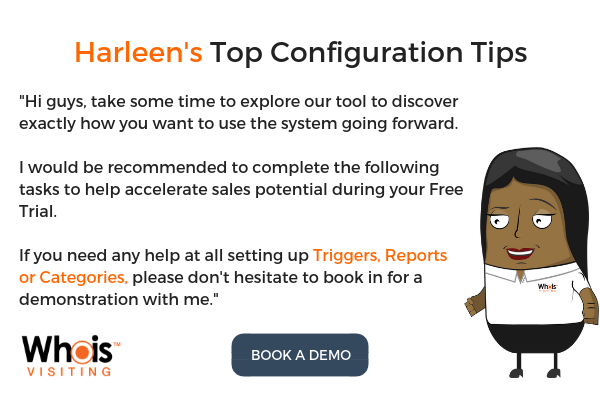 The most effective way to give your business the strongest chance of converting a sale in your Free Trial period is to follow up strategically, leveraging the information which you now have available. Do not get too caught up with the idea of identifying the exact person who visited your website. The interest of one person in that business represents the organisation as a whole and is enough validation for you to begin a process of re-targeting. At the very least, it is a point in the right direction for warm outreach. Create a priority list of individuals to reach back out to based on the most common job role you would normally communicate with. You may, or may not choose to disclose that you have identified their presence on your web page. Either way, your pitch must be guided by details of their journey through your site. Ultimately, the purpose is to engage, create and develop a relationship built on the foundations of offering value to a company which is of relevance. More often than not, you will find contact with the exact visitor, but even if that does not materialise, the effectiveness and result of the outreach should remain consistent. Our customers are successfully using multiple methods to follow up with their website visitors. It will depend on the nature of your industry. Everyone has different ideas for re-creating communication, depending on the urgency, buyer cycle and resources. Across your two week trial, all should be combined to give yourself the best chance of reaching your target. If the business is a small one, there's a chance that a handful of people will have access to, or even receive notifications from the business Twitter account. Conversations may spread around the office. It re-affirms the seed of your business name in their environment. This is an example of the underlying value of marketing. Don't be shy to respond to a Tweet or like their most recent / Pinned Tweet to add extra engagement potential. If you do want to send a Direct Message to their Twitter inbox, possibly sending an invite to return to the site or for a demonstration/consultation, this could also be effective. Remember to personalise the message as much as possible because automated DM’s have become so saturated that they are essentially useless. Lastly, if any members of the business do appear in the suggested follow, it would not hurt to connect with them directly. From Twitter, your next social point of call will be to LinkedIn. 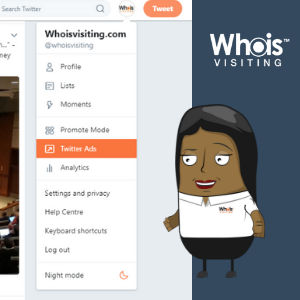 Within the company visitor information, WhoisIdentify will display for you the members of staff who potentially visited your website. By identifying the job roles and remits which you generally close business with, make educated connections through the options available. Make a connection, use a credit to send an Inmail or deliver a message directly to explore their interest further. Even if you do reach out to somebody who claims they have not visited your site, it may lead you to progressive business discussions anyway. Especially if you qualify that they are a company in an industry which would likely do business with you and match your ideal customer profiling. Then treat it as though it was a regular cold outreach situation. Emailing your website visitors is a way which our customers have used to generate leads conveniently. 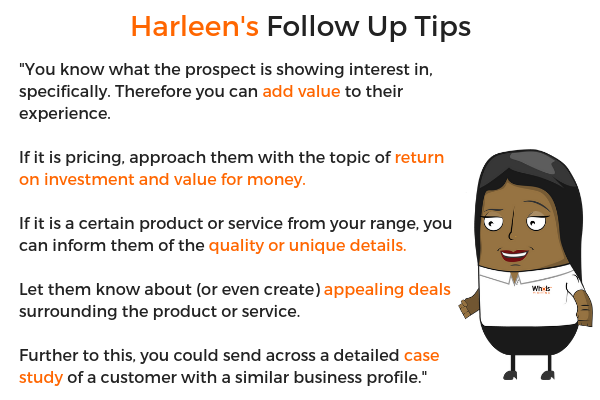 The importance of following up to an email can’t be stressed enough. 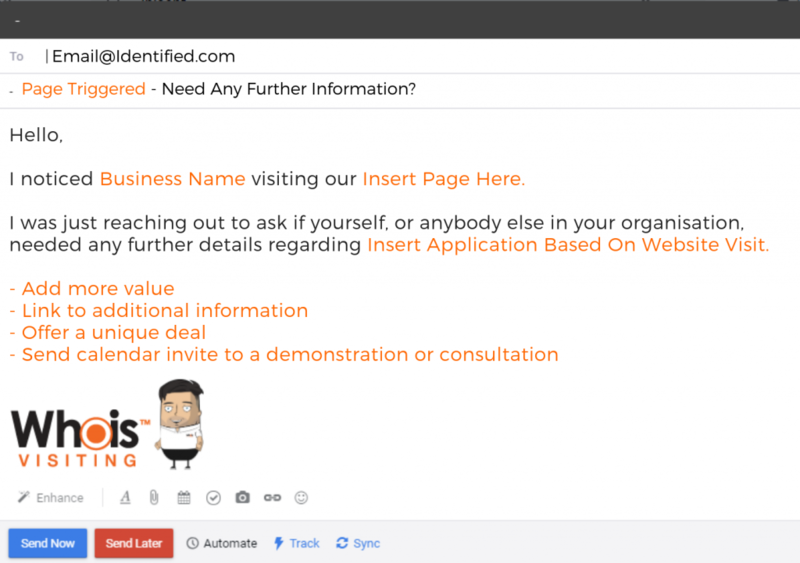 The number of emails which are unresponded to on the first attempt, but receive attention after the second, third or even fourth approach is excessive. Do not let the sequence go cold. It is your own personal and business choice if you wish to let them know they were identified or if you prefer to use a coincidental approach. Always add relevant links in your email to keep the interest alive and ask if to be be directed to the most relevant person, if it is not themselves. 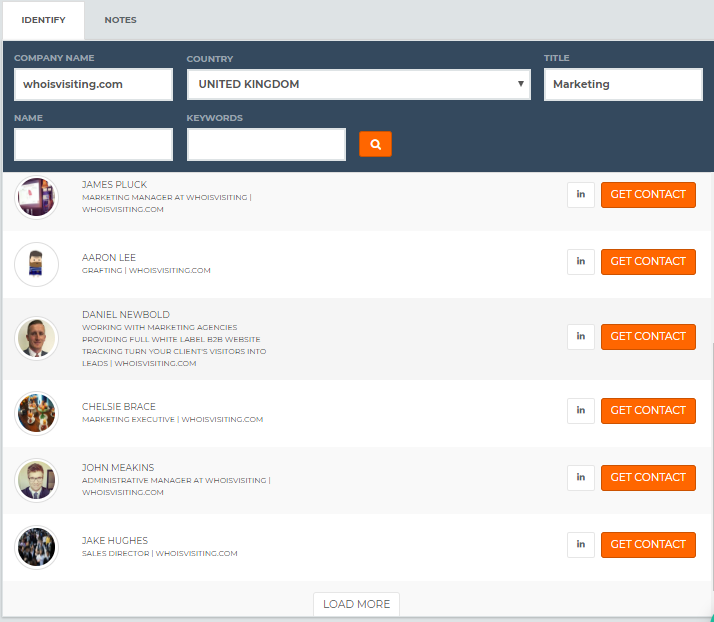 Using an email tracking solution such as MixMax, you can view the details and statistics of open rates. But the most successful way of making sales and at the fastest rate of turnaround, is by using the phone. Picking up the phone for many businesses is given a negative stigma and viewed as outdated. Especially in this era of pure digital opportunity, the phone has become a method of last resort. Social, email and other re-targeting methods are brilliant ways for patient prospecting and building relationships over time. But if you know someone is interested in real-time and you have the resources to look into that further, then do it. The follow up call provides the immediacy and directness of communication which can’t be beaten. It also gives a clarity of interest, rather than the unknown situation of waiting for a response. Just make a call, and find out now. There is greater scope to influence, provide context and adapt your pitch when on the phone. 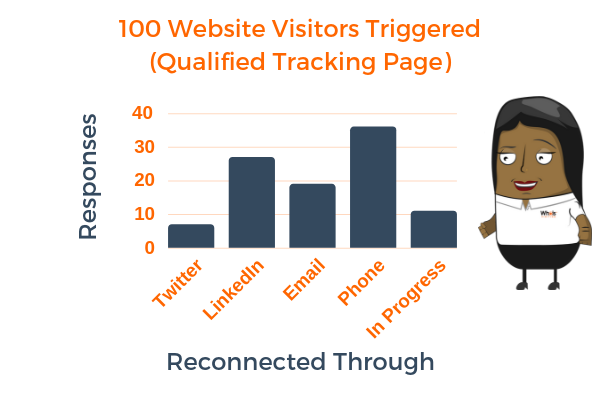 We have 100’s of clients whose foundational sales stem from the basic principle of receiving alerts of businesses on their triggered pages and investigating further. Results will always depend on the nature of your business as to whether you can physically conclude a sale in a two week period. We understand that every business has a different length of sales cycle. Some which last only a few days, but others which take weeks or possibly even months to close. Therefore, you will need to be realistic in managing the expectations. 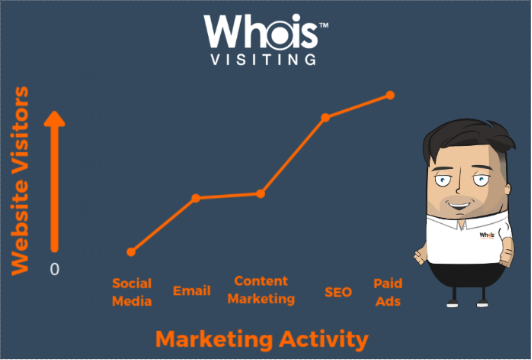 The overall point is that within two weeks, you will certainly be able to visualise the benefits of Whoisvisiting and strengthen the position of your sales pipeline. To give your business a direction of sustainable growth, it will always come down to value added and actually return on investment over a longer period of time.